We are aware that it is impossible to be fully certain that there would not be a chance for any project delays, regardless of how well-managed and planned most of its aspects are. Therefore, we dedicated a whole service just for analyzing these delays, their possible causes, impacts and the optimal way of dealing with them. 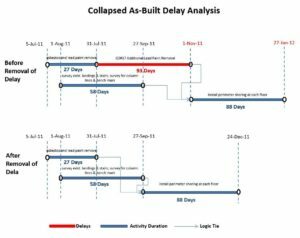 Delay analysis is a very challenging process; because you must be prepared for facing obstacles that aren’t practically there yet according to your project’s timeline, but are expected to arise. There is more than one aspect that we should consider while analyzing any expected delays, their possible consequences or what the optimal way to resolve them might be. CPM schedules and resource allocation plans are very important when a project is being tracked and monitored; whether to analyze existing delays or to avoid any upcoming ones in the future. Our team of engineers has proven to have the skills and experience in delay analysis that takes to keep up with all the industrial updates of techniques and software such as Primavera and MS Project etc. That’s why we can offer you a service that will not only make sure that your delays are analyzed properly, but will also work on recovering their consequences safely, in case they unfortunately arise. Furthermore, after analyzing the delays we come up with a strategic plan where we quantify damages, come up with options and weigh them all. In conclusion, we implement the optimal option that our experienced team of engineers sees fit most to your project. After implementation, the performance of the project is then put under observation; assuring that any delays are being recovered and any chances for future ones are minimized. At Pearls Construction, LLC, we do not only ensure that your project is being run on its optimal track, but we also know the importance of keeping our clients updated with the full picture. This is our compromise: during every process, our representatives will always be available; walking you through any updates and answering any inquiries you have about your project’s expected duration, possible delays, what their consequences may be and how they can be recovered.